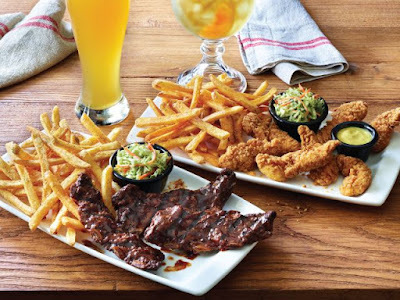 Applebee's rings in the new year with the return of all-you-can-eat Riblets as well as all-you-can-eat Chicken Tenders. Available for a limited time at locations nationwide, the Riblets first arrive in a 12-oz order featuring slow-cooked, bone-in pork riblets in either Honey BBQ or Spicy Texas BBQ sauce along with Classic Fries and coleslaw. Each refill consists of a 6-oz order of Riblets and more fries. If you go for the Chicken Tenders option, your first order includes seven breaded and fried chicken tenders with honey Dijon mustard for dipping plus a side of Classic Fries and coleslaw. Each refill includes three chicken tenders, sauce for dipping, and more fries. Both options carry a price tag of $12.99 (may vary). Additionally, you can go for a Mix & Match option where you start with either Riblets or Chicken Tenders and get refills of either option. The casual dining chain is also offering a limited-time deal where you can get a 10-oz draft of Blue Moon ale for $2 (price, hours, and participation may vary).